We've got cheerful early counting worksheets here, with colourful pirate illustrations. Who could resist counting up our pirates and pirate hats and parrots! And you will also find below a collection of pattern worksheets in children need to work out what comes next, and an exciting treasure map worksheet which gives children practice on co-ordinates. Help young pirates practise their counting skills with this colourful and fun counting worksheet! Yo ho ho! Count the pirate pictures and write the correct number in the box. This counting worksheet is one of three we have with a pirate theme. Here's our trickiest pirate counting worksheet! How many pirates, pirate ships and treasure chests can the children count? Use our pirate pattern tiles with our pirate pattern worksheet 1 and pirate pattern worksheet 2, or use them to make your own patterns. 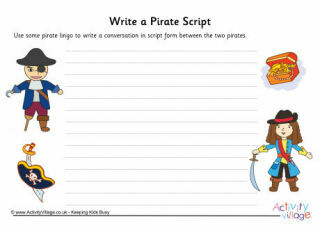 This colourful pattern worksheet uses pirates as its theme. The children need to work out what the next object in the sequence is, and either draw it in place or place the correct pirate pattern tile. What comes next - a pirate or pirate hat? A parrot or a skull and crossbones? Have fun using the pirate pattern worksheet on its own, or use with our pirate pattern tiles.